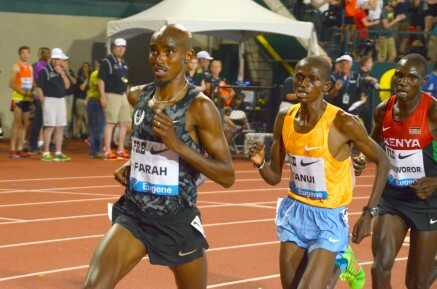 9th July 2015 – Reigning double Olympic, World and European Champion Mo Farah (GBR) was the victor in his first 5000m of the season at the IAAF Diamond League in Lausanne. With a race run in blustery conditions a tactical affair ensued but Mo took to the head of the field with 3 laps remaining. Although passed with 200m to run there was no panic as Mo gathered himself and once again showed he had the fastest finish crossing the full of emotion in 13:11.77. Shannon Rowbury (USA) stepped down to the 800m and took fourth place in 2:03.53. Lausanne was the final meet in a busy midweek period across Europe for PACE athletes. On Tuesday in Budapest Nancy Chepkwemoi (KEN) continued her fantastic recent form with her third 1500m victory in a row. Closely following the pacemaker for the first 800m she once again pushed on from the front and held everyone off crossing the line in 4:04.41. At the Cork City Sports Mary Cain (USA) took third in the 3000m. On Monday in Sotteville, Benard Kipyegon (KEN) improved his personal best to 1:45.81 for the 800m when taking third position. Mario Forsythe (JAM) was sixth in the 100m.